Sheriff Bill Brown, among others, receives a $35,000 check from the Sheriff's Benevolent Posse, which will help fund the D.A.R.E. program in south county schools. 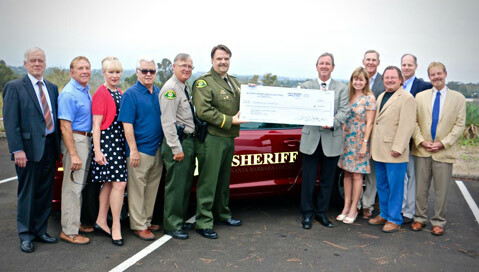 This week, the Sheriff’s Benevolent Posse’s, a nonprofit that fundraises for the Santa Barbara County Sheriff’s Office, donated $35,000 to maintain and expand the Sheriff’s Drug Abuse and Resistance Education (D.A.R.E.) program to south Santa Barbara County. After a 10-year-absence, the D.A.R.E. curriculum, which provides good decision making skills and drug and alcohol education to fifth and sixth graders, will initially expand to the Hope School District and two local private schools. Also instrumental to the program’s return are retired Sheriff’s Deputies Jerry Cornell, who will teach D.A.R.E. curriculum in south county schools, and Leslie Avila, who has been teaching the curriculum to over 1,000 students annually in north county schools for the past four years.